The United States Computer Emergency Readiness Team (US-CERT) published a vulnerability note yesterday about a new zero-day vulnerability affecting Microsoft Windows 8, 10 and Server editions. Microsoft Windows contains a memory corruption bug in the handling of SMB traffic, which may allow a remote, unauthenticated attacker to cause a denial of service or potentially execute arbitrary code on a vulnerable system. Attackers may cause a denial of service attack against affected versions of Windows by causing Windows devices to connect to a malicious SMB share. US-CERT notes that the possibility exists that the vulnerability may be exploited to execute arbitrary code with Windows kernel privileges. 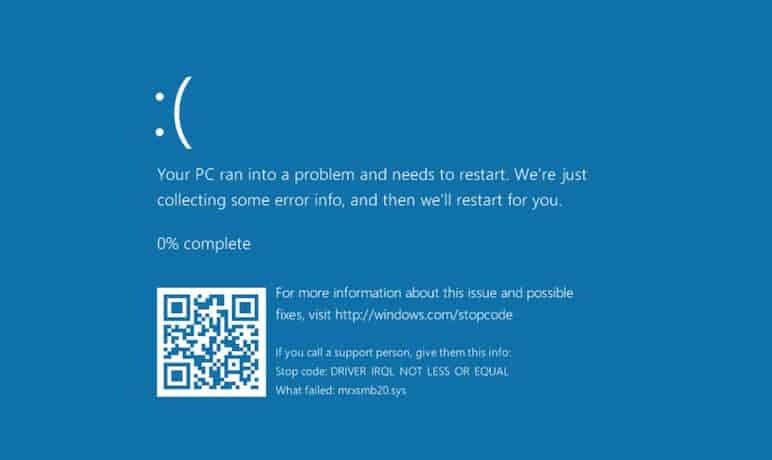 Attacked systems may throw a blue-screen on successful attacks. Microsoft Windows fails to properly handle traffic from a malicious server. In particular, Windows fails to properly handle a server response that contains too many bytes following the structure defined in the SMB2 TREE_CONNECT Response structure. By connecting to a malicious SMB server, a vulnerable Windows client system may crash (BSOD) in mrxsmb20.sys. It is not clear at this point whether this vulnerability may be exploitable beyond a denial-of-service attack. We have confirmed the crash with fully-patched Windows 10 and Windows 8.1 client systems. US-CERT confirmed the vulnerability on fully-patched Windows 8.1 and Windows 10 client systems. Bleeping Computer notes that security researcher PythonResponder claimed that it affects Windows Server 2012 and 2016 as well. While there is no official confirmation of that yet, it seems likely that the Server products are also affected by the vulnerability. US-CERT classifies the vulnerability with the highest severity rating of 10 using the Common Vulnerability Scoring System (CVSS). Factors that play a role in determining the severity of a vulnerability include whether it is remotely exploitable, and how much expertise attackers require to successfully exploit the vulnerability. Microsoft has not released a security advisory yet, but it is probably only a matter of time before the company publishes a security advisory to inform customers about the vulnerability and mitigation options. US-CERT recommends to block outbound SMB connections on TCP port 139 and 445, and UDP ports 137 and 138 from the local network to the WAN. to protect Windows devices. Home user networks may be affected by the vulnerability, but WANs are not that widely used in home environments. Tap on the Windows-key, type Powershell, hold down the Ctrl and Shift keys, and hit the Enter-Key. US-CERT published a vulnerability note yesterday about a new zero-day vulnerability affecting Microsoft Windows 8, 10 and Server editions. If you’re making fun of Microsoft’s marketing strategy to push people to Windows 10, I agree, it’s silly – Windows 7 is at least as safe as Windows 10, and arguably more. But let’s be clear that Windows 7 has been affected by zero-days too. Every OS (Windows, Linux, whatever) gets them eventually. The real issue is not whether an OS has them, but whether the developers are able to patch them quickly once discovered. Actually I’m just wondering how many zero-days spy organizations are quietly exploiting instead of warning the general public about them…. I’d bet the world’s security services have a boatload of OS vulnerabilities stored away. Martin’s Powershell command produced a blank on the 8.1 desktop PC where I tried it. So I guess that’s good. Still, a little more understandable info for the layman (like me) would be welcome. I take it that if you don’t use any kind of file sharing between your computer and other computers beyond your own home, then this problem doesn’t apply? Or is this putting it too simply? I got the same result on Powershell on Windows 8.1. I guess I am good. MS suggests that Win7 is unsafe. I can’t recall any other tech company ever bad-mouthing one of its own products. I’ve never had a problem with Win7’s security. It’s a damn fine operating system and MS should be proud of it instead of bad-mouthing it. MS seems desperate to get users to migrate to Win10. It’s not that they seem, it’s that they are. Desperate. Considering how Win7 is doing it’s way, like a feather in a storm, I wouldn’t be surprised that the company slowly but surely softens it’s inquisitive and all-advertisement policy. Maybe the OS will then be acceptable by January 2020 when Win7 officially retires. You need to run Powershell with elevated privileges as mentioned in the guide, it won’t work otherwise. I ran it with administrator privileges. Is there some level “elevated” above that? Isn’t it a bit irresponsible to go public before notifying the developer or have i missed when they notified Microsoft? The most secure OS ever made, designed specifically for today’s connected world. So much for it. or if a path was included, verify that the path is correct and try again. Does System connect to internet for check This? This vulnerability has since been downgraded to 7.8, which is still bad but far from the worst possible. @ Oxa: I ran it with administrator privileges. Is there some level “elevated” above that? Answer: ‘system’ is one, but there are hidden logons, too! guys…try Get-SmbServerConfiguration to see in Detail what is on/off etc.